For donors and charities, there’s no place like home when it comes to very large gifts, according to a new study of publicly announced gifts of $1 million or more released today by the Indiana University Lilly Family School of Philanthropy. 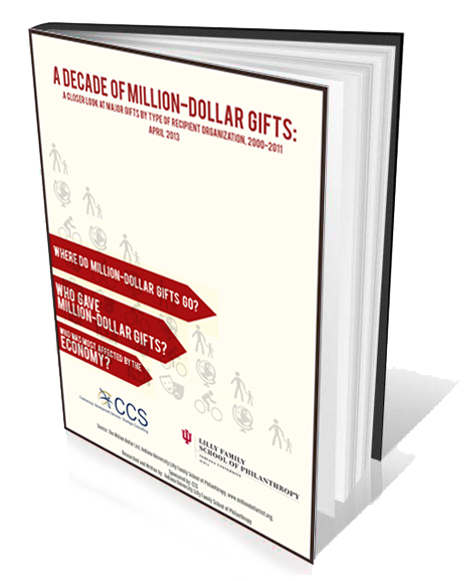 The majority of such gifts (60 percent) come from donors who live in the same state or geographic region as the nonprofit or foundation that receives the gift, the report finds. About half of all publicly announced gifts of this size (47 percent of the total number of gifts and 52 percent of the total dollar amount) come from donors living in the same state. In particular, health nonprofits, arts, culture and humanities organizations, higher education institutions, foundations and government agencies received more than half of their million-dollar-plus gifts from donors in the same state. About two-thirds of gifts of $1 million or more to these types of organizations were given by donors in their geographic region. The new report offers an in-depth analysis of publicly announced charitable donations of $1 million and above given to 12 different types of recipient organizations during the period between 2000 and 2011. The study and report are sponsored by CCS, an international fundraising, consulting and management firm, through their William B. Hanrahan Fellowship at the Lilly Family School of Philanthropy. “The opportunity to strengthen one's community can be highly attractive to potential donors," said Robert Kissane, President of CCS. "Nonprofit organizations that effectively communicate potential impact and seek out the right local donors may experience transformational gifts.Thoughtful cultivation and stewardship of these donors can often lead to life-long philanthropic partners and community-based advocates as well as influence peer giving within the community." The study analyzes data from the Million Dollar List, the Indiana University Lilly Family School of Philanthropy’s comprehensive, searchable online database of publicly reported charitable gifts of $1 million or more to organizations in the United States. The Million Dollar List provides donors, nonprofits, scholars and the public with insights into high-level philanthropy and tools that can inform and enhance their philanthropy. It currently contains over 68,000 gifts and is updated on an ongoing basis. Foundations and higher education institutions were the top two recipients of million-dollar-plus gifts between 2000 and 2011, with each receiving about one-third of the total dollar value of gifts at this level. The remaining dollars were relatively evenly split among the other types of organizations; no single subsector (apart from higher education and foundations) received more than 10 percent of publicly announced million-dollar-plus gifts. A small but growing number of million dollar gifts are coming from donors located outside of the U.S. There has been an increasing trend among some types of nonprofits to seek out high-dollar gifts from these donors. In particular, this approach has been successful for higher education institutions and some internationally focused foundations. Gifts of $1 million or more are sensitive to changes in the economy and in various economic factors, the study found. Publicly announced million-dollar-plus gifts fluctuated dramatically in both number and dollar amount throughout the 12-year period studied. Giving at this level to most types of recipient organizations declined from 2001 to 2003, and again from 2008 to 2010 before recovering somewhat in 2011. In general, publicly announced million-dollar-plus gifts to arts, culture, and humanities organizations and to environmental groups shifted the most in response to economic fluctuations, whereas million-dollar-plus giving to health and human services organizations shows the least sensitivity to variations in the economy. Million-dollar gifts from individuals were affected more by economic changes than were gifts from foundations and corporations, suggesting that even at this high level of giving, feeling financially secure is an important factor in individual donors’ decisions to give. Individuals and foundations are the primary sources of publicly announced gifts of $1 million or more. Approximately one-third of such gifts made between 2000 and 2011—representing half of the total dollar amount of gifts at that level—came from gifts made by individuals during their lifetime. If charitable bequests are included, individuals contributed 40 percent of all such gifts and 65 percent of the total dollar amount. Foundations, on the other hand, made 43 percent of million-dollar-plus gifts, accounting for 25 percent of the total dollar value. The full report provides an in-depth analysis of publicly announced million-dollar-plus giving to each nonprofit subsector. For each type of organization, the report examines trends in this level of giving over time, the type of donor, the impact of the economy, and the geographic distribution of gifts. CCS, a leading global fundraising consulting and management firm, provides fundraising, development services and strategic consulting to nonprofit organizations worldwide. With offices throughout North America and in London and Dublin, CCS designs successful and sustainable development initiatives for organizations across every non-profit sector. Founded in 1947, the firm is wholly owned by its partners and retains the largest and most experienced permanent staff in the industry. To learn more, visit www.ccsfundraising.com. In 2007, CCS established the William B. Hanrahan Fellowship in recognition of William B. Hanrahan’s contributions to the field and CCS’s commitment to shaping future leadership within the fundraising profession. Today the fellowship pays tribute to the firm’s late president and CEO, and supports research undertaken by doctoral students in Philanthropic Studies at the Indiana University Lilly Family School of Philanthropy. The Indiana University Lilly Family School of Philanthropy is dedicated to improving philanthropy to improve the world by training and empowering students and professionals to be innovators and leaders who create positive and lasting change. The School offers a comprehensive approach to philanthropy through its academic, research and international programs and through The Fund Raising School, the Lake Institute on Faith & Giving and the Women’s Philanthropy Institute.